The Royal Enfield Interceptor 650 and Continental GT 650 have finally arrived in India, and at very tempting prices! The Interceptor 650 and Continental GT 650 are built completely from the ground up - the chassis is all-new and so is the engine, which is a twin-cylinder motor. The engine is an oil-cooled 650cc parallel twin that develops 47bhp and 52Nm. And all of that is sent to the rear wheel by a six-speed gearbox, which also gets a slipper clutch. Both the motorcycles share a steel-tube cradle chassis, which comes with telescopic suspension up front and twin gas-charged shocks with adjustable preload at the back. Braking system comprises a 320mm disc at the front and 240mm disc at the rear wheel. Both bikes come fitted with 18-inch spoke wheels on both ends as standard. Of the two motorcycles, the Interceptor 650 is more of a laid-back cruiser, while the Continental GT 650 is a sporty café-racer. As a result, the former has a relaxed riding position, while the latter has a more aggressive stance. The Continental GT 650 also comes with a single-seat setup. Additionally, the Interceptor 650 has a 13.7-litre fuel tank, whereas the café-racer’s fuel take has 12.5-litre fuel capacity. A lot of customisation options are available with both the 650 twins, which means the company is offering these bikes in some really cool colours, including a shiny chrome paint finish. Both the bikes will come with 3 years warranty and road-side assistance coverage as standard. 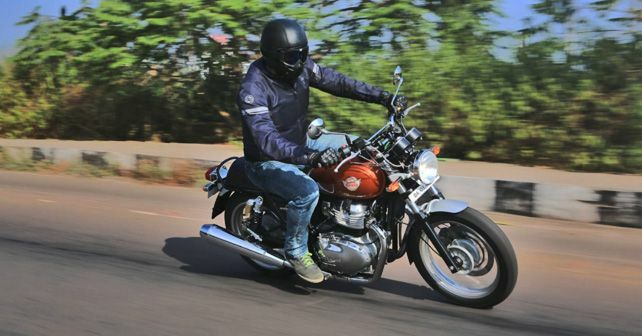 There’s no direct competition for the Royal Enfield Interceptor 650 or Continental GT 650, which, in addition to their stellar prices, will only help bring even more volumes for the brand.